Well, that's it - gardening season is officially over. That's not to say there's not plenty of work that remains to be done, in and around the garden. Not a chance. It's just that our short growing season has officially come to an end. Yup, you're seeing that correctly - when I woke this morning the temps were in the mid twenties. 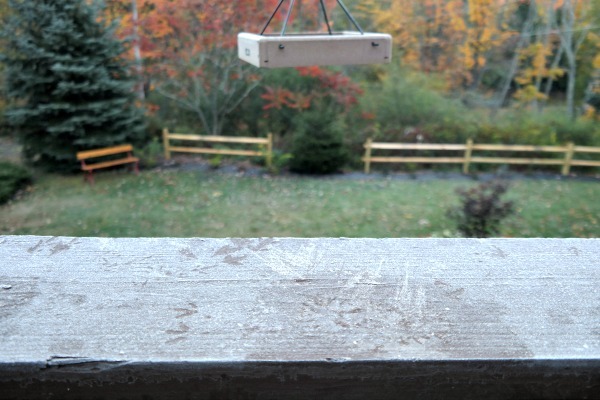 I walked over to fill the bird feeder and there was ice on the deck and frost on the deck railings. And there were tiny birdie footprints in the frost. Poor little things! I've been watching the weather forecast, of course, and I knew it was coming. Which is why yesterday I spent a couple of hours in the garden, harvesting everything that was left. Not a bad final harvest for a tiny little crooked garden! We certainly got our money's worth out of those seeds I bought last winter. After I got a big pot of soup simmering on the stove, I settled down at the kitchen counter with that pile of dried beans...and a martini...and got busy shelling. 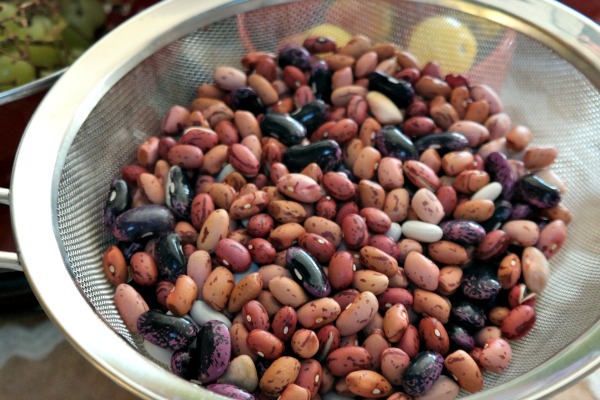 These gorgeous beans will make a few amazing pots of soup this winter! 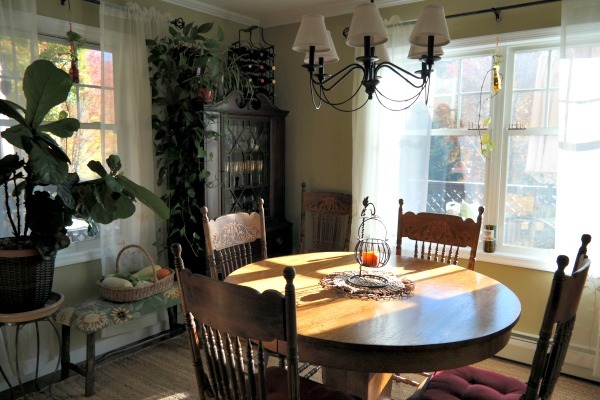 The autumn sunlight streaming in on this frigid morning was so lovely, I couldn't stop snapping photos. The wood stove has been lit continuously since Sunday, and truly does an amazing job of keeping the house cozy and warm. In the mornings before work, I sit in that leather chair closest to the fire with my coffee and a good book. 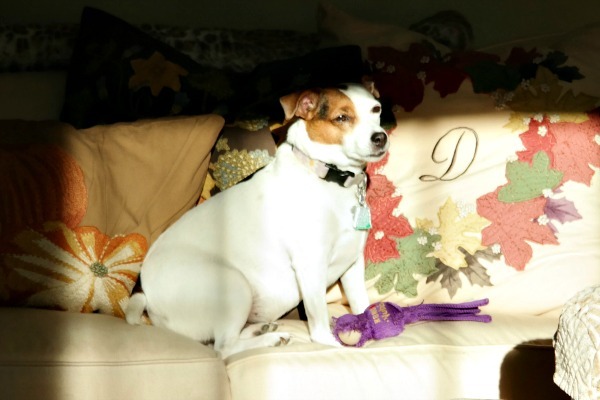 Of course, no photo of my home would be complete without a few doggie toys thrown around. 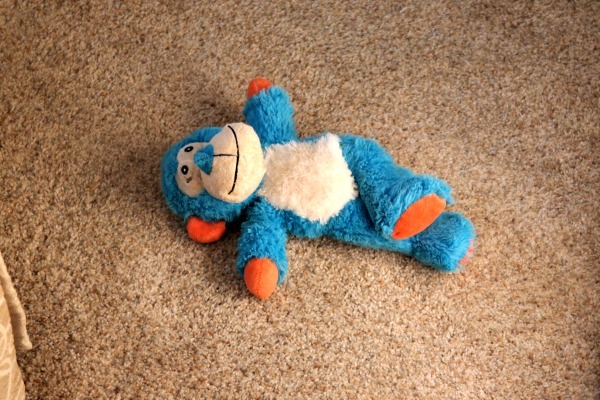 This little monkey belongs to....guess who....? She loves to find the sun puddles in the mornings and settle in for a snooze. As we move into the next season I am so grateful for the months of warmth and sunshine that gave us such a wonderful harvest this summer. 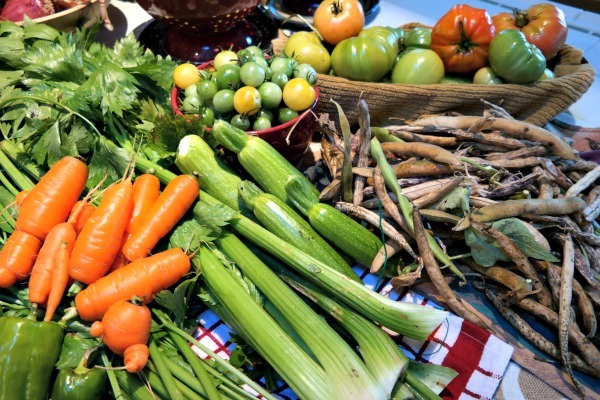 Our growing season may be short but we sure do pack an awful lot of garden goodness into such a short span of time! Now it's time for cozy fires and good books. Which is just fine with me - I could use a little rest and relaxation! Your garden was totally amazing all summer. Loads of great food and you have tons of it canned too. 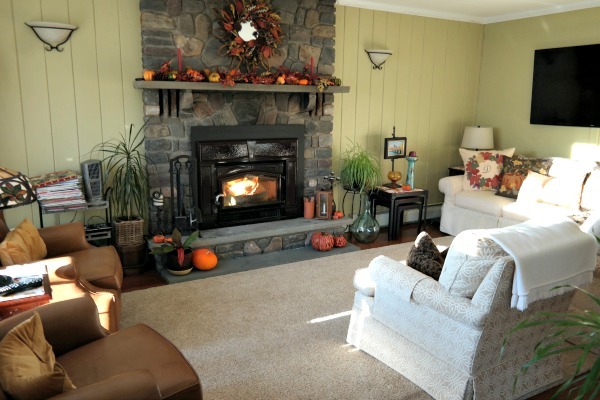 Now the house looks like it is ready for snuggle time by the fire. I have a stack of magazines next to my chair calling my name, Marty! Oh my gosh, shorts and the air conditioner? It's almost like we live in two different countries!! Your garden was incredible this year. I'm so impressed. I love all your pics. Happy Fall. It was a great little garden, Valerie, and I will miss my fresh produce so much now!! I had to let the fire die out today, Susie, it was so warm in the house!! And yet, nights are so cold....brrrrrr! Temps in the 20's? Brr, that's so cold already! We've had several nights dipping into the high 30's and I thought that was bad enough. No frost here yet, but it's coming anytime now. Your home looks so pretty and cozy. I would love to curl up by that fire with a good book - sounds heavenly. You sure reaped a wonderful bounty in your garden - kudos to you! Thanks, Melanie! That's pretty much my favorite way to wind down, is to curl up in that chair with a good book and either a cup of something hot or a nice glass of red wine! 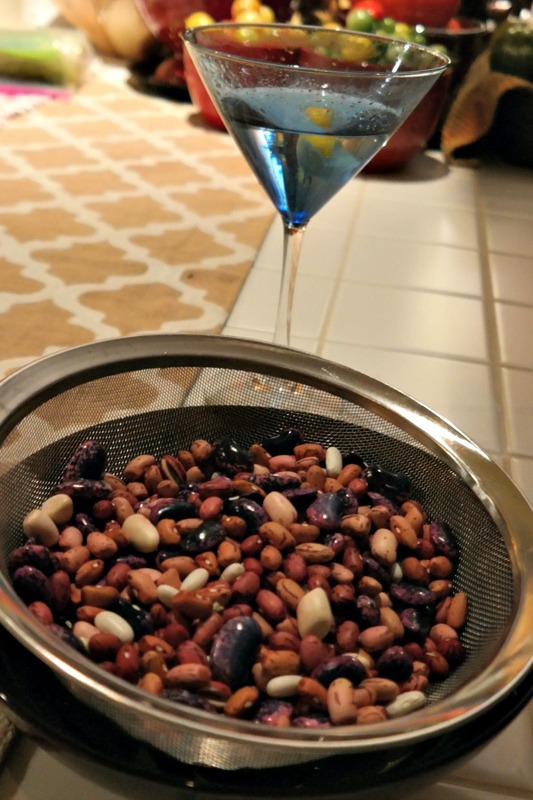 Such a cozy post, martinis go well with shelling beans! You really did get a good harvest just in time. Adorable little dog, she's a cutie. She is a cutie, that's for sure - and she loves her toys!! We got to around freezing last night too. Had to bring in the recently purchased mums. I guess Fall is here?? And here I thought I could hold on to summer just a weeeee bit longer ;). Nope, we are in the Northeast, my friend, and summer is a thing of the past at this point!! Wow! It got really cold at your house soon! I thought we were cold this morning as we were in the low 40s! Your garden produced some yummy looking veggies! All of those different beans look so good! Your house is so pretty and warm and comfy looking! Thanks for sharing it with us. I do love my little house, Shelia - it's truly my sanctuary, my refuge! Everything is still lush and green here but changes will come soon. Enjoyed your photos and also your love of the seasons...Very sorry to read about the losses in your personal life. Thank you - it was a very rough time and I'm glad to put it behind me at this point. It's good to be able to find beauty again instead of pain and heartbreak. Oh my goodness, you and I both have very similar blogs today don't we? :) I commend you for putting way more effort into your post though, mine was just pictures. ;) I was saving my energy for my grandkids coming to visit later in the day...well that is my story and I'm sticking to it! LOL! Be blessed my friend! I laughed when I saw your post because I had just finished posting mine that was so like yours!! I am so sad :( we had the same weather and I am going to miss gardening . youre right, we did have a short season but here's to next year! CHEERS!! Also, love the photos of your home. GORGEOUS! Now's the time to put in your spring bulbs for next year, Ellen, if you really want to keep the garden bug going a little longer!! I'll miss the tomatoes the most, I think!! Supermarket tomatoes are so lame in comparison! You did so great with your garden this year. You will love having all those wonderful meals this winter. I will surely love having all those meals in the winter, Kris! I also shared some with my aunt who lost her husband recently - it was good to be able to send her some home cooked meals so she wouldn't have to think about cooking or going out alone. You did so well with your sweet crooked little garden. Next year's garden will be even better. Your house looks so comfy/cozy, very welcoming. Thanks, Lorraine - I've been thinking of you with the hurricane and hoping your little plum cottage was ok! Aww, thanks Summer! A different kind of beauty, for sure, than what you get at your lovely home! 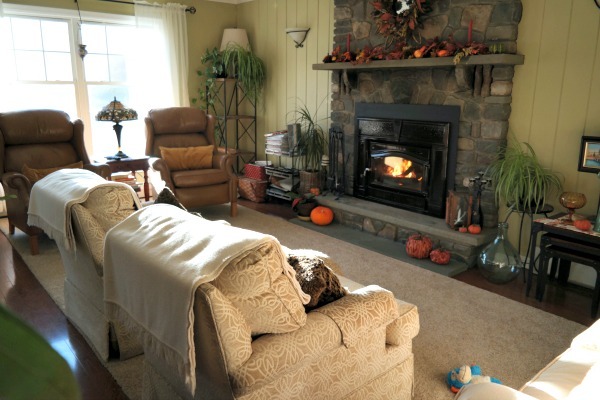 Such a warm and cozy home, even though the frost is shimmering outside! I Love the pictures, the doggies, the harvest! You are truly blessed! If your photos weren't so beautiful this would truly be a very depressing post! Thank goodness for the beauty of it all. Sorry to depress you, Rita - I don't mind the cooler weather, every season is so lovely on the mountain top! 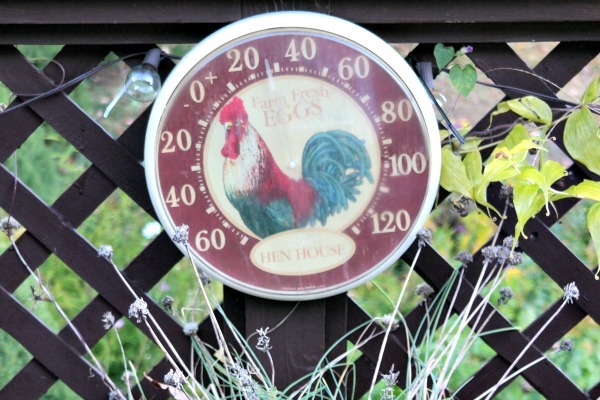 Hard to believe it is time to pack the garden in, isn't it? Summer flew by here. That is really cold- I think we usually beat you to freezing temps but you are ahead of us this year (that is a race I don't want to win anyway). It's always sad to pack in the garden, but I also adore the change of seasons! Yup, it won't be long 'til the snow flies, Deb! 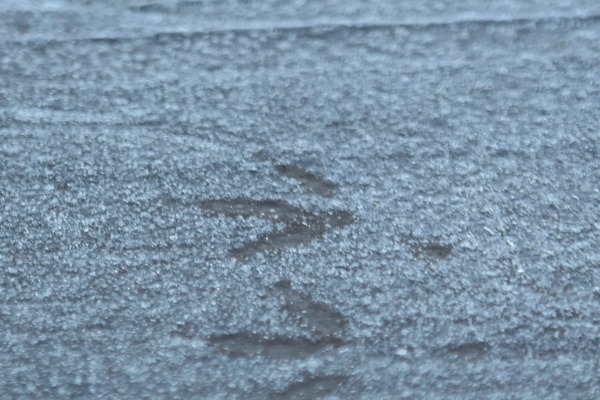 Birdie footprints in the frost?! I swooned! :-) What a cozy nest you have! This post made me feel as if I've had a mini-vacation. How lovely, Jean...I'm glad I could make you feel that way!! It truly DID do awesome this year, although there were fails also....there always are!! Such a lovely post...your harvest of vegetables is wonderful and everywhere looks so cosy and ready for the change of season. 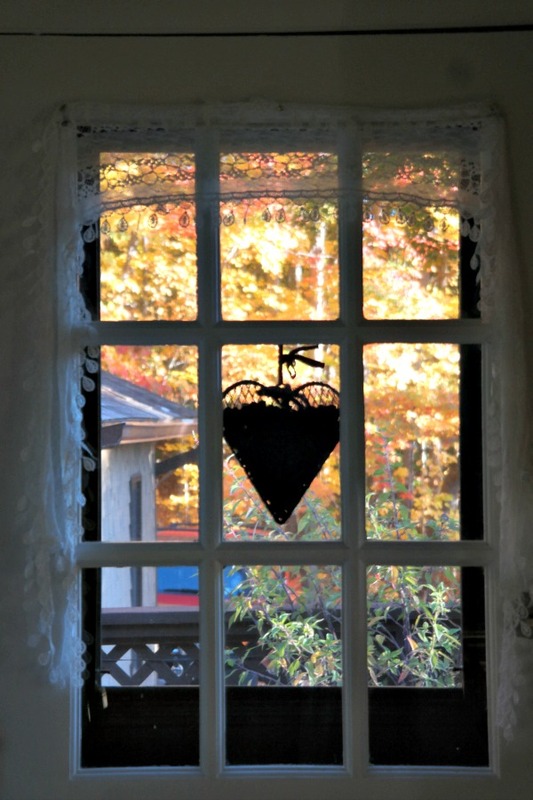 Like you, I love the summer and the gardening, but I am happy in the cosy autumn and winter too. We are those type of people who would not be happy in a place where the temps are warm all year, I suspect! Wow, back to 80's - that's mid summer weather for us!! Your place is so charming and cozy. It's so cold up there already, but boy oh boy, you make the most of it. Cheers! You're right, Kim, I definitely do! And cheers right back at ya, my friend - have a great weekend! This post reminds me of a favorite Little Golden Book called "Two Little Gardeners". The illustrations are so cute. It is just like your garden, from planning, growing and harvesting and then settling in for the winter. Oh, how sweet! Someday when I have grandchildren (not yet, please!!) I must remember that book!